Cissy is wearing lingerie from 1958. The doll is estimated to be right at the transition of 1959 when a new format of stringing dolls and one piece arms that were both better suited for various dolls Alexander had in the works. 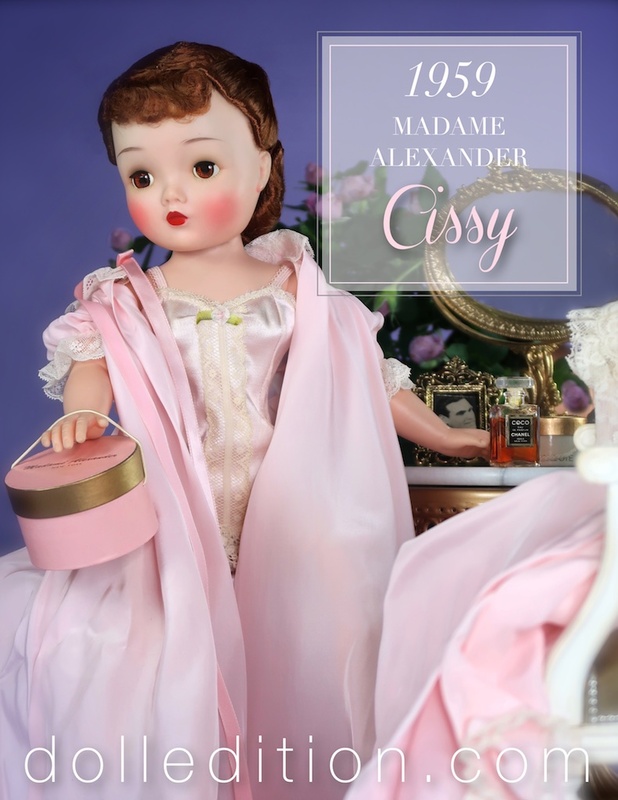 For those who love all-things-Cissy, collecting her has become a doll-world phenomenon. Documenting and discussing the fine details of her fashion rein can be intoxicating for some and time to change the channel for others. 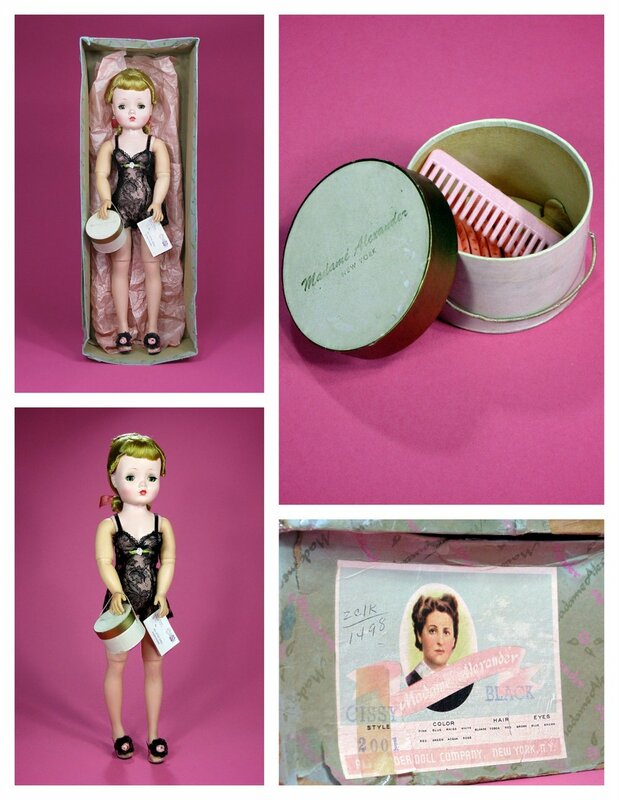 Since the Alexander Doll Company was not inclined to keep documentation of its design and production in its vintage years, some collectors have tried to connect the dots of progress. One of the hiccups of Cissy's story is about 1959 when a production change started to show up on the beloved 20/21" fashion doll introduced in 1955. Two changes had occurred that would seal her fate with the company. She had peaked in 1957 - and the ever-so-slight nudge saw fewer dolls and extra clothing in the company catalog in 1958. A bigger issue was that the competitions 20/21" fashion dolls had switched over to vinyl heads with rooted hair in 1957 - a point not lost on Madame Alexander who still used the more elegant wigs for her upscale dolls. The tradeoff was wigs were far less play-friendly in the "next big thing" of a fiercely competitive doll market. Oh, to be a fly on the wall when these changes are decided. Part of the more critical picture was Alexander had two new face molds for their 1959 line - so the ball must have started rolling in 1958. Both 21" Shari Lewis and Disney's Sleeping Beauty would require separate molds. New molds were not something that Alexander did a lot of - changes were created more through wigs and costumes. Alexander was switching over to a stringing system for these dolls and abandoning the previous walker style bodies Cissy was first produced. Long story shorter, once the decision is made, Cissy was a hodgepodge of new and old parts until she was retired in 1962. There are any number of combinations of heads, arms and torsos that come around for collectors to examine starting in 1959 and even 1958. Mid-century fashion had a number of layers - what you saw and what you didn't. The Fashion Doll was also a way to teach little girls how it all came together. The Cissy in this edition of the dolledition.com blog came indirectly to me by its original owner. She had two other Cissys from 1958. She received this doll last. Being a little older, and now not playing dolls the same way, this doll was admired but left to be stored away in this remarkable condition. I have her dressed in a boxed 1958 lingerie set. I am making a guess she was a basic doll, and if so, she would have arrived in a chemise with high heeled mules and hose. She does not have earring holes in her ears, which is typical of the basic Cissy. She has the new Cissy head mold that started appearing in 1959, with the previous walker body and two-piece arms. This new head mold regreatably sits lower on the dolls neck, and the term "short neck Cissy" is born. The most interesting detail is she has brown eyes. Brown eyed Cissys show up now and then — with various discussions that might include the eyes have changed color, the eyes were replaced and probably more accurate, Cissy sometimes received brown eyes. When Cissy still has her box, there are two eye color options of blue and brown that are printed on the lable. In this case, having the same brown eyes as the 1959 Shari Lewis, it's quite likely there was an abundant amount of this color available, and some got used for Cissy. The new Cissy head mold that started to appear in 1959 had a bigger neck opening which caused it to sit lower on the dolls neck. The plastic had a more irrodescent quality to it, which added a suttle new feature. The Basic Cissy came dressed in a cream or black chemise, wearing coordinated high heel mules, hose, carrying a hat box with hair supplies and a hang tag on the wrist. Although the 1958 Basic Cissy did wear pearl earrings, more typically these dolls did not. The dolls box has a check-box for both blue eyes and brown. This particular Basic Cissy is from 1956. 1959 Shari Lewis has the same brown eyes as the featured Cissy on dolledition. The doll Shari Lewis was for a one year run - so remaining brown eyes were likely to be used for other dolls. Some of the fabrics used for Shari Lewis costuming is repeated with extra boxed clothing for Cissy.